Next up in my Spring/Summer 2011 nail tutorial series is a fun Marc Jacobs print. A really easy one to re-create and perfect for spring fingers and toes! *You can find so many cheap dotting tools on eBay for around £1.50 from Hong Kong including delivery - here are a set of 5 two way tools for only £1.40 - from a really large seller. Also there is totally no need to worry about extra charges as the package is so light. This is such an easy look to achieve but I thought I'd still go over how to do it, just in case you are new to using a dotting tool. 1. Firstly you need to paint your nails with your base colour making sure you let the nails totally dry in between coats and before you move onto the next step - or else you risk ruining the base shade with the dotting tool. 2. Next I find getting everything set out the easiest - you can either load the bright pink nail polish brush with nail polish and the turn it upside down and place it onto a magazine (so the brush is pointing upwards) and continuously dip the dotting tool onto the brush. Or what I like to do is put a little of the nail polish onto a small piece of photo paper (I use photo paper as it doesn't soak up the nail polish like normal paper does) and I just dip my dotting tool into the little pool of polish as and when I need it. 3. If you are new to using a dotting tool I'd quickly dip it into abit of nail polish and test it out on a piece of paper - but trust me it is so easy. For this the larger the dotting tool the easier it will be as the dots are quite large, however the dotting tool I used was quite small, so I just loaded it with more nail polish to get a larger dot. 4. As you can see above I start each nail with two dots at the tip of the nail always in the center, then work downwards to the bottom. This really does keep the dots looking really uniform and neat. I then just go down each of the two sides with more dots... using the center dots as a guide. You really don't need to clean the dotting tool at any time while doing the dots on the nails. If the dots start becoming more spiky looking or you end up joining up two of the dots (which happened on the bottom dots of my middle finger) it's because the nail polish you are taking from is getting tacky so either pour some more out or re-dip the brush into the nail polish and carry on. 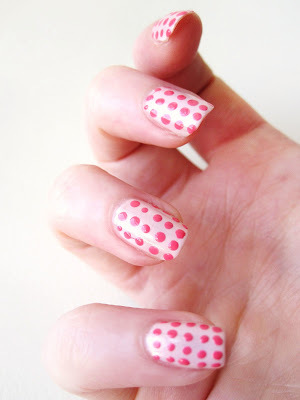 If the dot is too small just go over it with more nail polish on the dotting tool. Make sure to finish off with a top coat and you're done! Check out yesterdays Jil Sander print nail tutorial here. I can't believe that I've never heard of a dotting tool! You just change my life. I can't wait to try out this technique with fun summer colors. Thanks so much!! I love those, I might try this out myself. i reaaally really like this! will probably try it this weekend or something :) thank you! Great and simple! will def try this next time!